NYU students target their school's association with Chase, the leader in home foreclosures in New York. Members of NYU's Students for Economic Justice draw attention to the university's connection to home foreclosures. 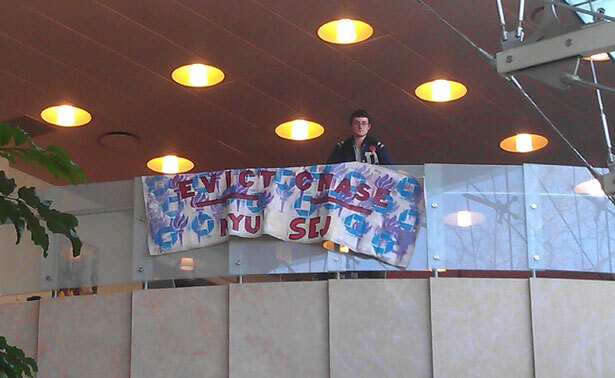 New York University students rushing to class through the Kimmel Center on April 4 were surprised to discover a banner hanging overhead reading “Evict Chase,” while members of Students for Economic Justice (SEJ) distributed flyers and led a spirited round of chanting inside the student center. This temporary disruption was the most recent action by SEJ to bring attention to the ongoing foreclosure crisis in New York City and NYU’s connection to it. The group delivered a letter to President John Sexton at last month’s University Senate meeting, asking him to end the school’s relationship with Chase, the leader in home foreclosures in New York, until the bank starts respecting the human right to housing. Sexton has yet to respond to the letter. According to a recent report by New York Communities for Change (NYCC), 1 in 5 New York City mortgages are underwater. If banks offered principal and interest reductions, the report argued, the New York City economy would see a $910 million annual stimulus, generating 13,286 new jobs. Cities and municipalities across New York State, such as Hempstead and Ithaca, have moved their money from Chase Bank after a study by NYCC found that Chase pushed more families in New York into foreclosure than any other large financial servicer.